To the south of the church in Preuilly, an alley in the shadow of the buttresses leads to a long building which housed the monks' dormitory. On the ground floor, near a short arcade, are the remains of the cloister. 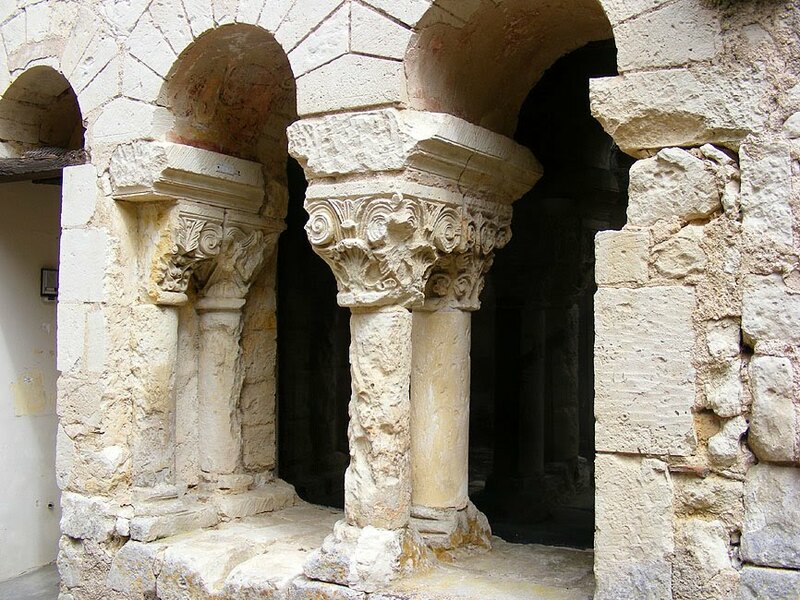 The dormitory was redesigned in the 15th century to become the chapter house, with a ceiling of four rib vaults supported by a central column. 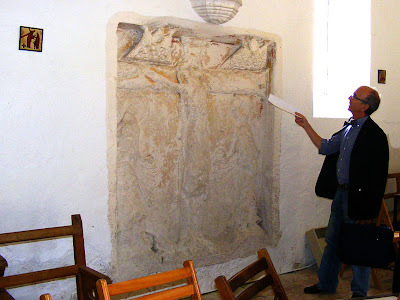 The far wall is decorated with an interesting 12th century bas relief crucifixion, unfortunately very damaged. Further along two more arcades were updated to a double colonnade resting on a platform, and surmounted by capitals with vegetal decoration. 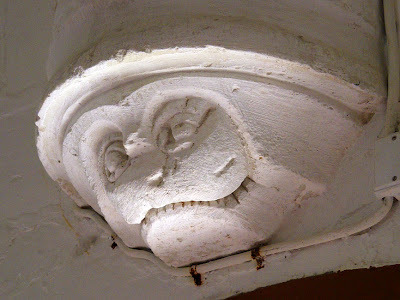 The base of one of the ceiling ribs. local archaeological society, pointing out details). I commented on Friday that we would be starting closing the bathroom walls "tomorrow". Pleasingly, we were able to start on Friday morning, so after a bit of discussion about where the ceiling will actually go (you need to be sure of these things before you start the walls), we started with glasswool and plasterboard. It isn't a fast process, as we are taking extreme care to make sure the insulation is sufficient, with no gaps, and we are double taping it to make sure it will not shift over time. This means that once it is done it is done for good. Luckily the weather of late has not been all that warm, but but even so, working up in the roof space you are aware of any warmth at all and it has been very humid. And for once, I'm not talking about apples. Several weeks ago our 86 year old neighbour Mme B. had a spell in hospital. While she was there her son took his opportunity to clear out her barn. One day an enormous skip arrived on a truck and was dumped in the middle of the street, blocking the way for the entire day. 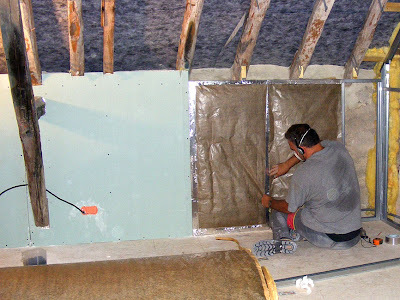 Guy had also called the pest controllers to come and deal with a severe outbreak of fleas in the barn and over the course of the day, Tyvek overalled figures beavered away, spraying, clearing and chucking. My friend Sylvie and I watched from her top window and debated whether we would go down and ask Guy if we could have a couple of the chairs and a wooden chest, but we decided that in view of the possibility they would be infested, we would pass. Two skips worth of stuff was carted off, and a few days later we discovered Guy at the brocante, with a stall featuring the best of the barn's contents. 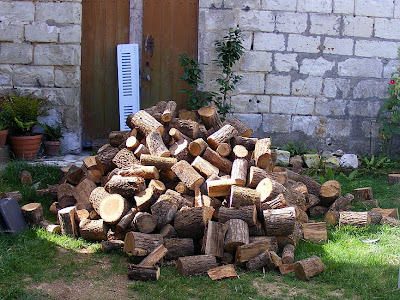 He told us there was a quantity of firewood still in the barn and asked if we wanted it. We said we would and arranged to come and collect it yesterday. The wood is oak, about 15 years old. It is at least that long since Mme B. switched to heating the house with oil. 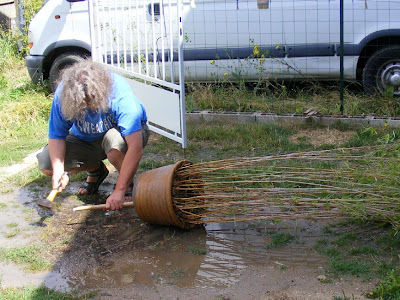 It's cut into 30 cm lengths and will easily fit into our stove. Guy needed it removed because it was stacked up in such a way it was preventing access to the upper floor of the barn, and we had to be really careful when loading our trailer, because the old wooden ladder which lead to the trapdoor was in constant danger of falling on our heads. The wood was also stacked in a window alcove and on top of the well. Now it's gone he can order another skip and ditch the contents of the upstairs. We figure there is at least 2 cubic metres of wood, which at today's prices is worth €80+. 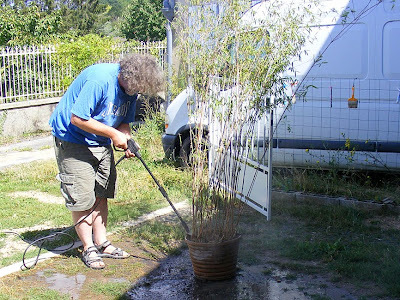 Guy resprayed all the wood with malathion (or something of that ilk - it really stank!) so he could be sure it was 'propre', then helped us load it into our trailer, even though he was due to compete in a trompes de chasse competition that afternoon. Neither he nor his mother would accept any money for the wood. 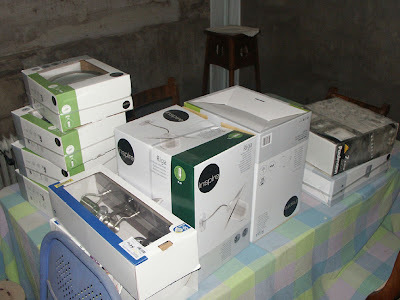 His mother is (inevitably) complaining that he threw out things that she now wants, but as he said, it was an absolute bazaar in there, and desperately needed sorting. It was tremendously kind of them to think of us and very generous of them to give us the wood. I will be buying them a nice bottle of Chinon at the very least. We've left the wood airing on the back lawn overnight, and today, we are going to tell our visitors that the task is to stack it all neatly in the garage and down one side of the apéro terrace (gloves will be provided). Last night we were lucky enough to be on the invitation list for apéro at Château Valcreuse, owned by Caroline and Alexander. 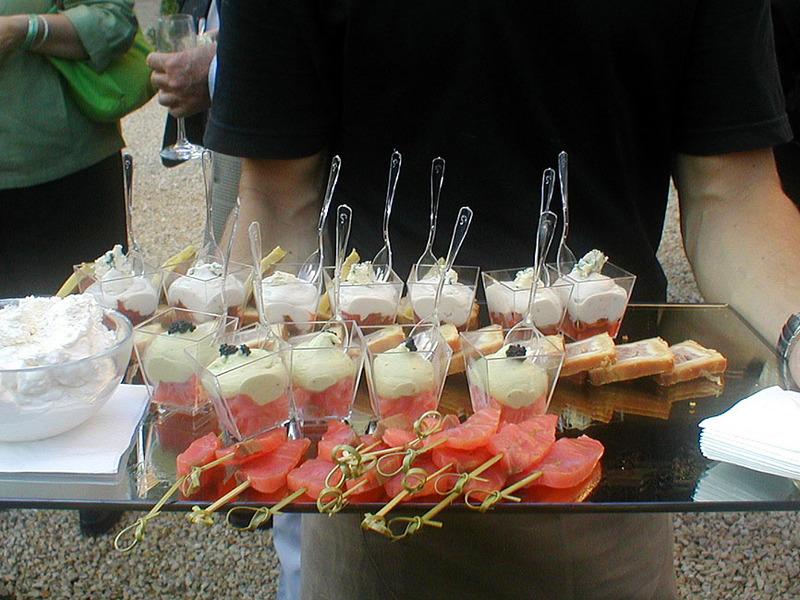 We have done some work with them this year, taking their guests on picnics or collecting them at the station. 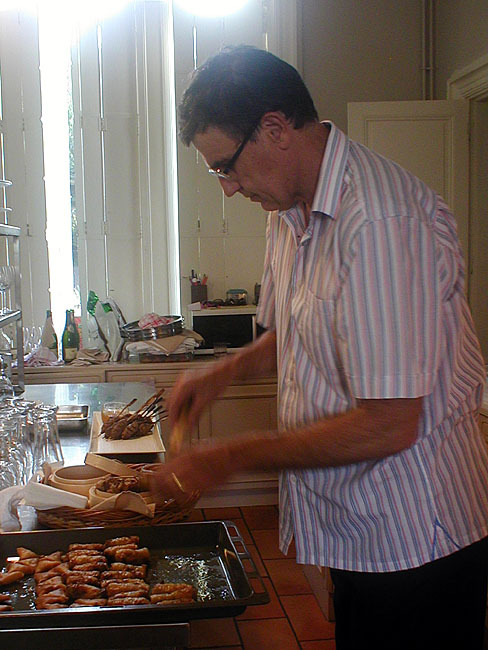 The food at the party was supplied by Sidney and Alison from le Calabash, who run a cookery school and catering business in the area. Célestine parked outside the château in pride of place. Sidney, a blur of activity in the kitchen. The trouble with going to parties where there are French people is that they can all dance - properly - and do so with very little encouragement. It means that as a non-French person, one has no option but to slink off and sample the cheese platter, since there is no way one can get up and dance without looking like a gallumping hippo. The band, a swinging jazz quartet was local and excellent. 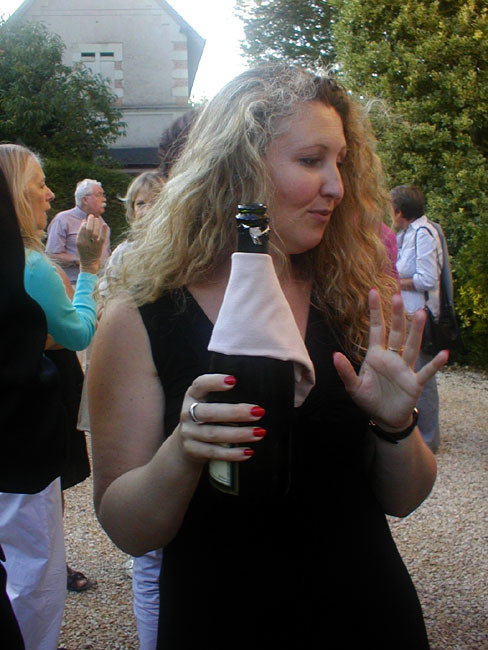 Thanks Caroline and Alexander, Sidney and Alison - it was a great party and we really enjoyed ourselves. Work continues on the upstairs bathroom, and so far the decision making about what goes where is just keeping ahead of the execution of the work. Which is the right order, but probably frustrating for Stéphane, as he has to keep asking "have you decided where...?". Still, as Susan told him yesterday we are just preparing him for other clients: at least we can make decisions when required, and then don't change our minds after making changes become difficult (most of the time: it has happened, but that's life). 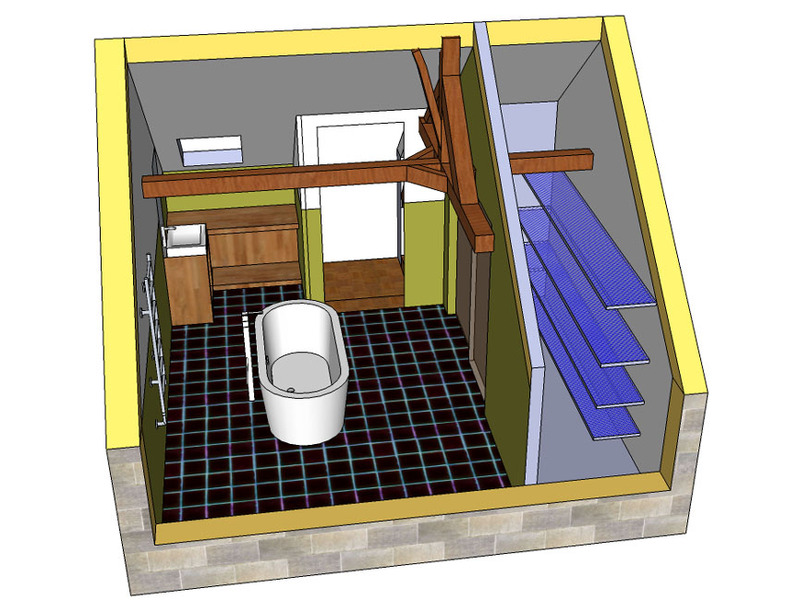 I am pretty sure that in the world of renovating houses for people half the clients will just give an idea of what they want and live with the results, whilst the other half micro-manage. We make sure we are involved in every detail of the final product, but once we have decided what we want we ask if it's possible, feasible, and not too much added work, then let him run the show. I can then concentrate on asking what to some might seem silly questions, but Stéphane is patient with me and explains what is happening as he goes along. This means I am learning stuff, slowly, which I might be able to use later. The right shape and 50% off the price! On Wednesday we went shopping for lights, heated towel rail, and a handbasin for the bathroom, and high density insulation for the landing at the top of the stairs. The lights, handbasin and insulation we have purchased, but the towel rail we finally decided on as being the closest to what we are after was out of stock (this is a good thing, as it allowed for reflection and a change of mind). 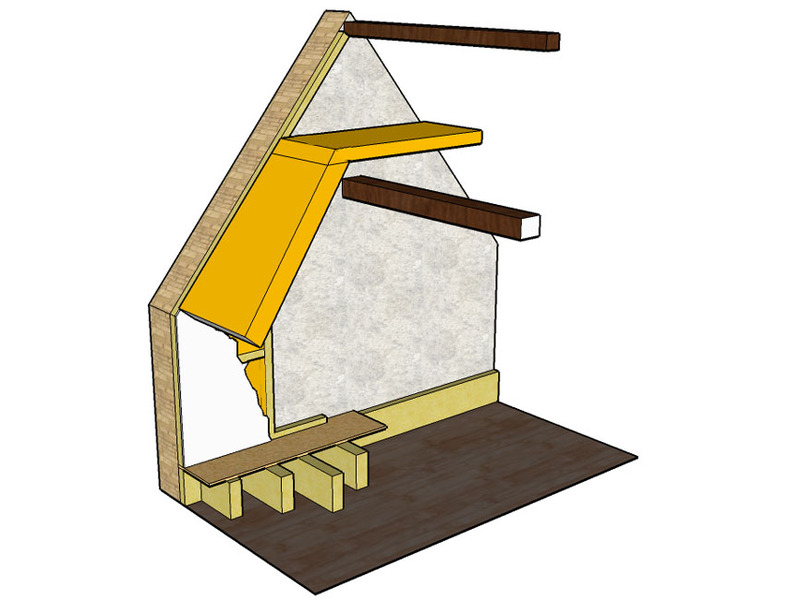 The insulation for the landing at the top of the stairs is a slight problem: the house predates glass wool insulation (by about 500 years) so no allowance has been made for the 200mm (8 inches) of space needed to prevent heat loss. The maximum we can fit in there is 100mm, and even that makes the roof awfully low. 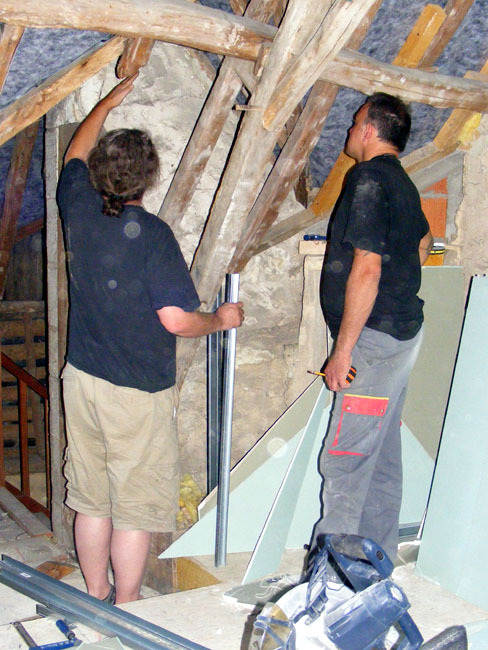 Luckily there is a new range of glasswool insulation which is 30% more efficient than previously, so although we won't have the European standard amount up there, we will be closer than we feared we would be. While we were in Leroy Merlin we also priced sliding doors for the large cupboard, which although will be more expensive than we hoped are less expensive than we feared. We also looked at regular doors and benchtops, both of which we have yet to make a final decision about. The custom made sliding doors must be ordered soon, because they are on special at 40% off, which is a quite considerable amount of money. A table full of light fittings. At the moment, our bathroom plan looks like this. We're not definite on the colours, but at least we are sure where the doors, plumbing and electrics will go. Just as well- we start closing the walls tomorrow. 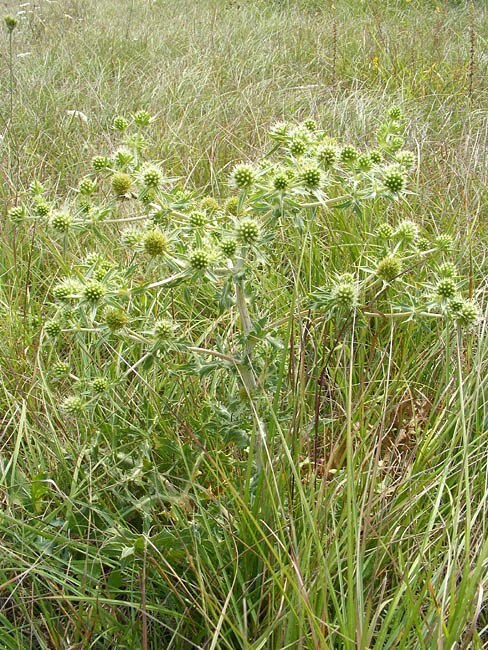 Common on roadsides and uncultivated land is a rather striking ghostly grey green plant, with stiff needle tipped leaves as spiky as any thistle. It's called Field Eryngo in English and le Panicaut champêtre in French. 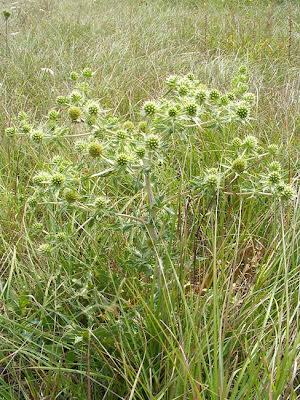 The scientific name is Eryngium campestre. It's not related to thistles at all, but to carrots and parsnips. 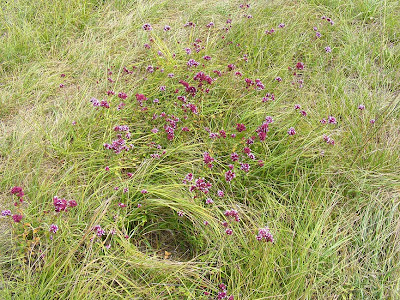 The plants emerge during the spring and by late summer are perhaps 40cm high and flowering, contrasting with the surrounding grass both by their pallor and their rigidity. The flowers are held in balls above decorative ruffs of spiny bracts and attract nectar seeking insects such as this Burnet Companion Euclidia glyphica moth (la Doublure jaune in French) above. Since we have fruit trees, I make jam during the summer reasonably regularly. Sometimes Simon does too, and although we hadn't done much jam making before we came to live here, we really haven't had the sort of problems other people seem to have, particularly with jam not setting. Now that I have played around with various methods and settled on a basic technique that works for me, I want to work on improving the fruity flavour and reducing the sweetness of our jams, so I've been reading up on jam making. Yellow plum jam on the boil. An easy rule of thumb is that jam should be 50% sugar and 50% fruit. That's the ratio I currently use, but I'd like to drop it to 3 parts sugar to 4 parts fruit. 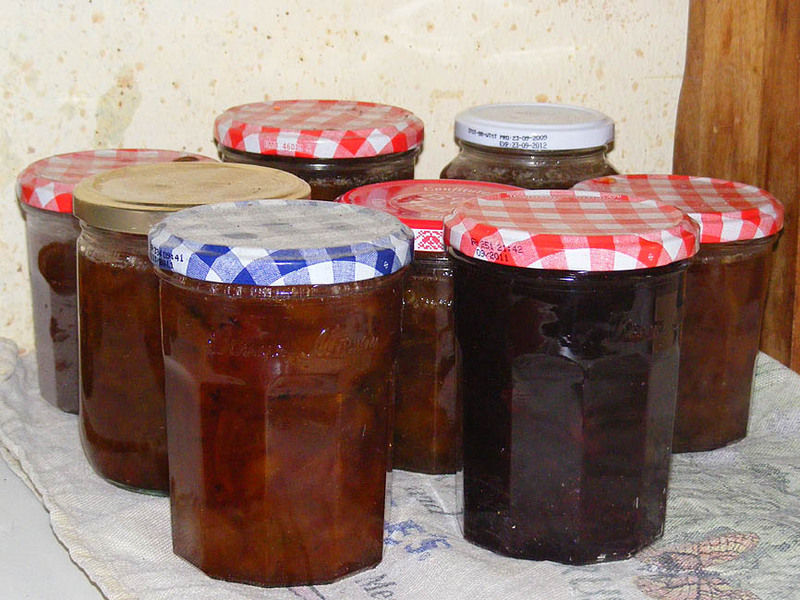 By law in France, commercial jam producers must adhere quite closely to the 50/50 rule, or they cannot call their product confiture. But they (and their consumers) are clearly interested in variations in the fruit/sugar levels - for taste, for health, to save money, and who knows what else. You can buy jam in the supermarket with a 65% fruit content, so it becomes 'confipote' or 'fruité intense' or 'confiture allégée en sucre'. Why is a low sugar jam not a jam then? It's mainly because the sugar acts as a preservative, binding the water content and preventing moulds from developing then causing the jam to ferment, which alters its flavour and texture (it becomes more liquid). When heated together the sugar attracts the water from the fruit. The cell walls in the fruit burst and release pectin too. The pectin is only released at high temperature, and the presence of the sugar means that boiling point is above 100°C. (Beware - the pectin will irreversibly break down if you go more than a few degrees over jam temperature for more than a few minutes.) Dispersed amongst the fruit water, the pectin molecules cannot join together, but once the sugar has bound the water, the pectin can form a gel. A certain amount of evaporation takes place as well, which helps thicken the mix. The ideal ratio for this transfer of molecules to take place turns out to be a sugar content of between 50 and 65% (remember that the fruit itself contains sugar). Apparently too much sugar can cause crystalization. The final player in the mix is acidity, which aids the attraction of the pectin molecules to one another. Once the jam cools, all the elements should have formed a network resulting in perfectly set jam. Yellow plum jam and apple and blackberry jelly bottled and cooling. Many people will tell you that a runny jam cannot be reheated and boiled a bit more to thicken it, others will tell you the opposite. I'm in the second camp - my experience is that if it doesn't set overnight in the jars, chuck it all back in the pot and boil it hard for 5 or 10 minutes and re-bottle it. If your problem was it hadn't reached jam temperature the first time it will be fine. If your problem is that you have boiled it too hard in the first place, try adding some pectin and strictly controlling the temperature at jam temperature this time round. Many people will tell you to add lemon juice or half a lemon to any and all jams. This is presumably on the understanding that the pectin needs that hit of acid to reassemble and that the lemon itself contains pectin. My personal preference is for no lemon - I find the flavour overpowers the fruit, and I can't see why the acid naturally present in your fruit of choice wouldn't be sufficient to activate the pectin. Many people will tell you to make sure you mix fruit that is rich in pectin (citrus, apples, redcurrants) with fruit that has less (apricots, peaches, strawberries, cherries, blackberries), but we never have any problem with our cherries, so I am not convinced this is necessary. However, I have this year made a batch of apple pectin and put it in the freezer for adding to jams next year. This so I can reduce the sugar a bit but still get a good set without cooking the jam for too long and losing flavour. Apple pectin is easy to make. I use my imperfect apples, cut out the bad bits, chuck them in a big boiler, cover with water and boil for 20 minutes. The apples are well and truly mushed by then. I tip the lot into a muslin which we suspend from the back of a chair over a bowl. The theory is that the resulting already slightly gelled liquid is pectin. I rinse out my muslin in very hot water and hang it on the line to dry, but if you were worried about it not being sterile, you could simply iron it before using. Many people recommend using copper pans for jam making as the metal ions link to the pectin and aid gelling. However, the tarnish on copper pans is toxic, so I don't fancy it, and, like beating egg whites in a copper bowl, I've never found it necessary. If you do use a copper pan, apparently calcium citrate, available at the pharmacy, neutralises the vert-de-gris. Many people swear they can tell when their jam is ready by putting a teaspoon of hot jam on a cold plate, waiting a few minutes then pushing the jam. If it wrinkles it's ready. This technique never worked for me, although Simon uses it. I always use a thermometer and make sure the jam has reached 105°C and stays there for 5 minutes. Pectin is released rather slowly, so a relatively long cooking period is required, but this means that many volatile aromatic flavours are lost. There is no reason you can't cook the fruit first to release the pectin, then add the sugar and leave it to dissolve and bind up the water. This is useful when making jellies, as you can boil the fruit, strain through the muslin overnight, then add the sugar and bring slowly to the boil to ensure it is all dissolved, then boil hard to reach jamming temperature. 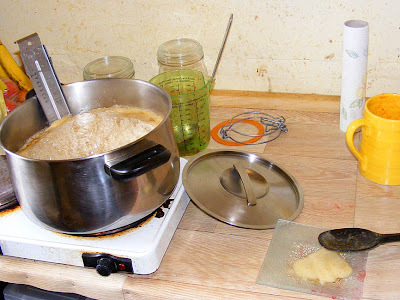 Making apple pectin should also solve this problem, in that you are adding it already activated to another fruit jam. It doesn't matter that the pectin has lost its apple flavour by being cooked hard earlier. To help prevent loss of aromatics, don't stir the jam too much either. Having said that, though, it is wise to stir every now and then, just to check it's not burning on the bottom. The foam that forms on top of the boiling jam must be removed because it leaves aerated trails through the jam which can allow moulds to grow. However, there is no reason you can't eat it, and added to yoghurt, or spread on bread still warm as an after jam-making snack, it is delicious. Rapid - the current trend. Chop your fruit and macerate in an equal quantity of sugar first and the fruit will break down quickly and release its water and pectin. Long - unavoidable if you want to reduce your sugar content or increase your fruit content. The advantages are that water will evaporate and you will get a thicker syrup form, the fruits burst, the pectin is liberated, the house smells fantastic...but you risk losing flavour with the aromas. Vilmorin, depuis 1743, it says on the packet. British readers will have heard of Suttons, Unwins and Thompson and Morgan but how many have heard of Vilmorin? Yet this is one of the oldest and most active of seed companies in the world. In the 18th century they were at the forefront of introducing wonderful New World and Asian plants to western European gardens and today they are the fourth largest seed company in the world. The big British seed houses listed above were all only established in the 19th century, and Suttons has been owned by Vilmorin since 1993. Linnaeus had only developed his bionomial system for creating taxonomical sense of the living world ten or so years before Phillipe-Victoire de Vilmorin took over his wife's family business. She was the daughter of Louis XV's botanists, a husband and wife team who had set up a seed and plant business in Paris. 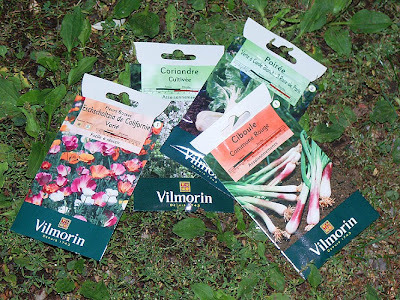 Vilmorin was also a botanist and responsible for introducing new plants ranging from the Virginia Tulip Tree to the field beet. Throughout the 19th century family members continued to be involved with the business and plant breeding. They are particularly noted for having published academic notes which laid the foundations for modern seed breeding and improving the field beet from little more than fodder to such an extent that French sugar beet was able to compete against Caribbean sugarcane. France had been forced to develop its own sugar industry from the early 19th century, when the British blockaded the coast to prevent imports during the Napoleonic Wars. Even today you will see field after field of sugar beet in northern France and most sugar in the supermarket is derived from beet. If it has come from cane it will say so on the packet. 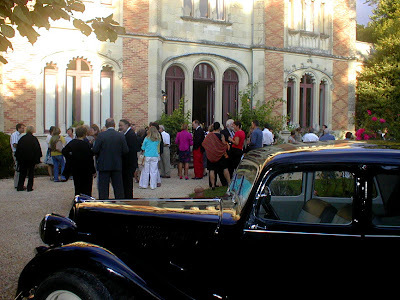 Today the headquarters of Vilmorin are on the Loire, between Angers and Saumur. They are now the principal brand in multinational group called Limagrain. Their core activity (95%) is the production and distribution of vegetable seeds. They sell 35 species with 500 varieties and are the market leaders for carrots and beans for processing (50% of processed beans in France come from Vilmorin stock). They are also the market leader for tree seeds in Europe and 50% of forestry tree stock in France has been grown from Vilmorin seeds. 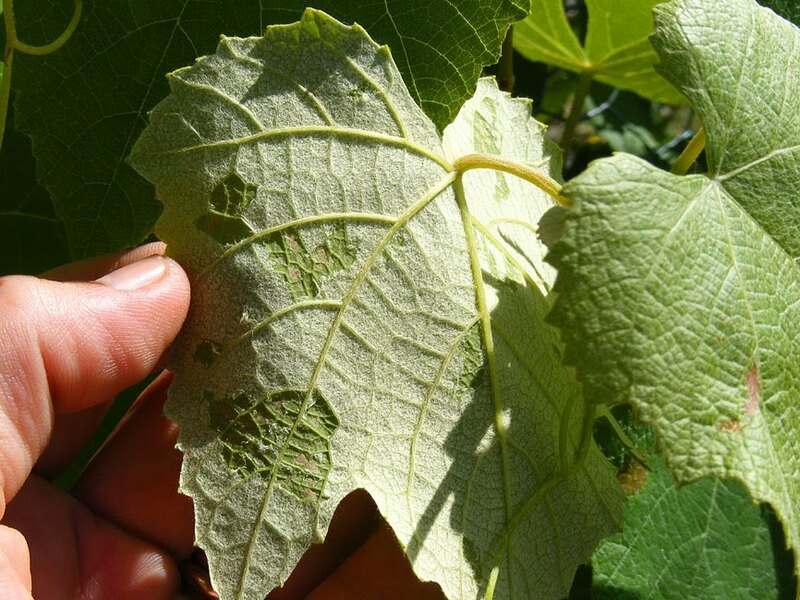 Their range of 400 species includes broadleaf, ornamentals and rootstocks. 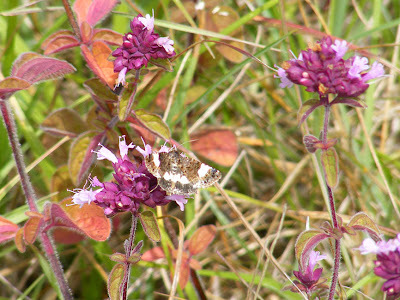 Wild Oregano Origanum vulgare (or l'origan in French) is in full flower in August. I spotted a particulary nice patch in the field next to our orchard. Getting there to photograph it involved scaling the roadside ditch and bank. 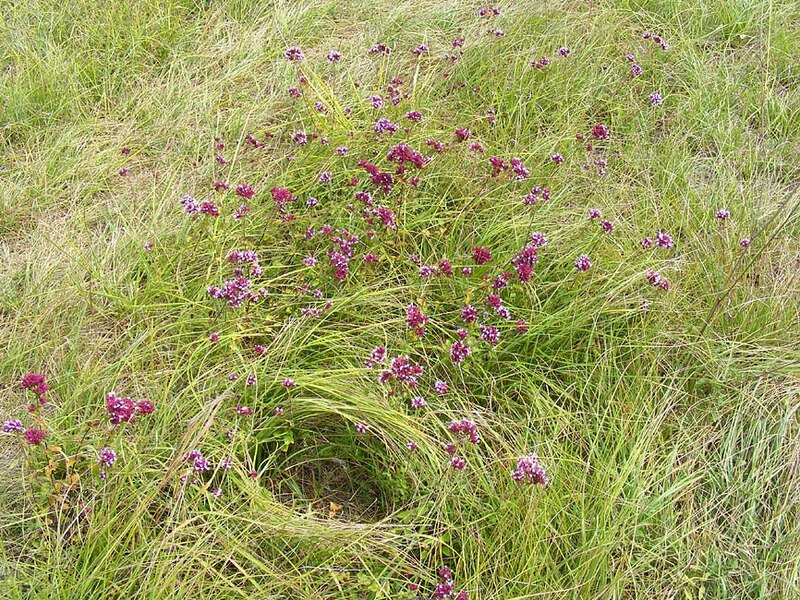 Once I got close I noticed a neat oval of grass - not a nest, but presumably a comfy hidden bed for some creature. Was it a mammal or a bird? 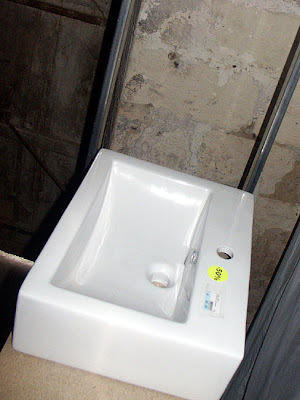 It was about 20cm wide by 25cm long and I would be most interested to learn what made it. Enjoying the oregano was the day flying noctuid moth the Four-spotted Tyta luctuosa (la Noctuelle en deuil in French). This species is abundant here and I am, somewhat reluctantly it has to be said, growing substantial quantities of its larval foodplant, Field Bindweed Convolvulus arvensis (or le liseron des champs in French), in the potager. Also present was one of my favourite butterflies, Lady Glanville's Fritillary. This bamboo has been in the same pot for 10+ years. It was well and truly time for it to be split up and potted on. The roots were creeping over the top and there was no room to hold any water. 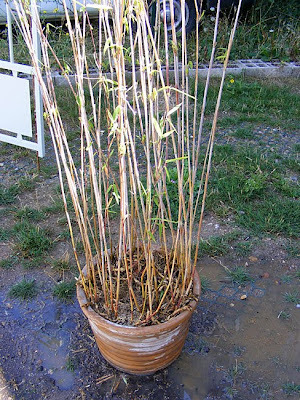 The bamboo was suffering from the overcrowding and the dry. 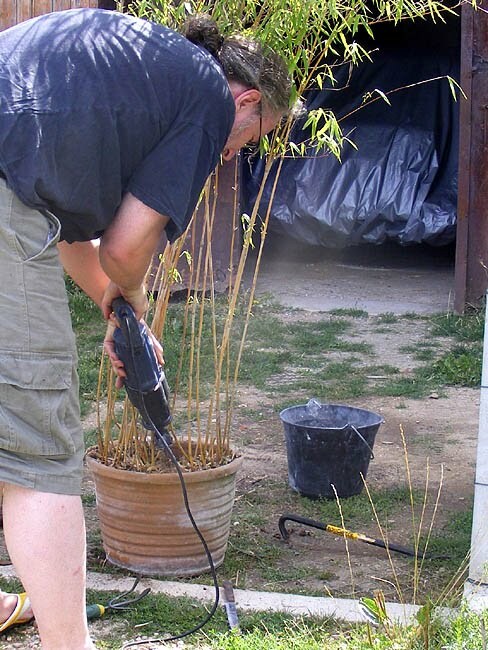 We didn't want to sacrifice the pot, which is terracotta and a good size, so after soaking the whole thing over night we tried blasting the soil out with the pressure washer, in the hopes that the roots would then loosen their grip on the pot. No chance! 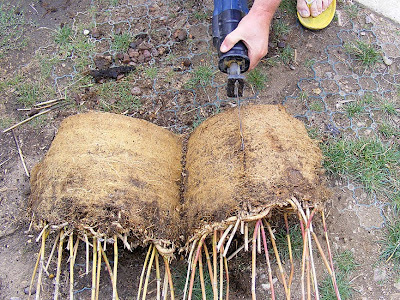 So then Simon drilled a larger drainage hole in the bottom and tried thwacking the root ball from underneath. A few pebbles fell out, but otherwise no movement, so we retreated for a think. ...but they still weren't going to come out without a fight! Once Simon got that first little bit out though, the whole thing lifted out and he was able to saw it up. 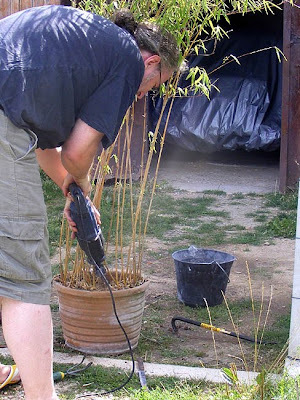 Crude, radical, but ultimately effective, saving both pot and the 'bush'. The pieces have now been planted in three pots in the hope that they will form a light screen between us and the street on our front courtyard. The original pot now holds a promoted Osmanthus x burkwoodii, visible over the corner of the green bench seat in the foreground. I wrote a couple of days ago about the St Andrew's cross in our attic, having previously written about the fact our house was at one time bigger than it is now. These matters are not unconnected. 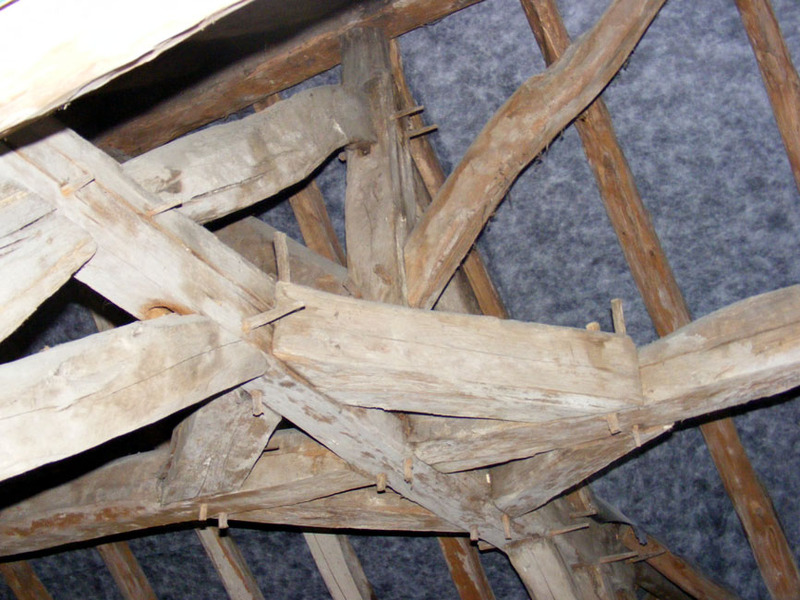 In our attic we have 1½ St Andrew's crosses which is unusual, because no-one ever builds half a St Andrew's cross. They are always built complete and in the open part of a span, never against a wall. which means at one stage we had two of them. 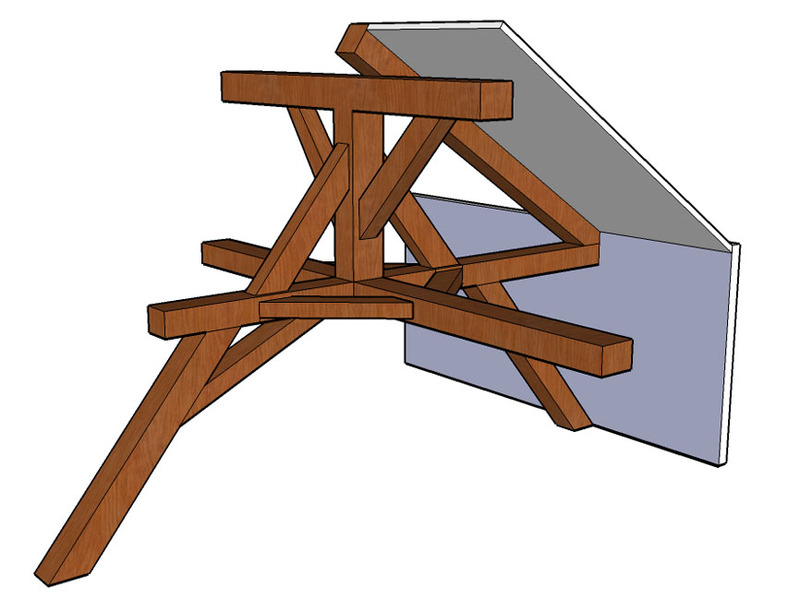 Thursday's photo was of the complete structure, the following photo is of the half cross. I could be wrong about what part constitutes a St Andrew's cross, as I have always understood it to mean a diagonal cross. 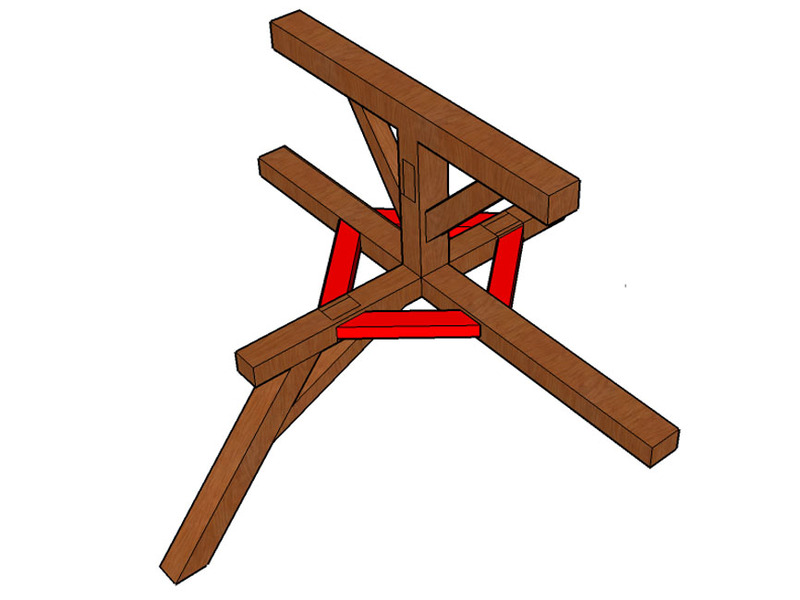 The resources I have found on the internet are rather ambiguous when the term is applied to carpentry, and at least one site shows something as a St Andrew's cross that we just don't have. The wall around the half cross is just filled in with bricks, whereas the rest of the attic is stone. This indicates the wall is much later than the cross, adding strength to the theory that the house was once larger. 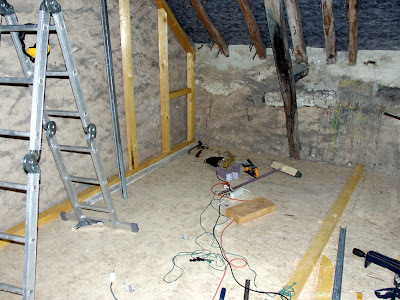 The top photo was taken when we cleared that wall before commencing building a frame for the insulation.The carpentry built into the wall will then no longer be visible, but the parts which protrude from the wall will be. Not the sound of us renovating the attic, but the sound of nature in action in the potager. One of the things we appreciate most about Preuilly is how quiet it is. It's so quiet I can hear the Wool Carder Bee Anthidium sp (l'anthidie in French) ripping the fuzz off the back of a grape leaf to line her nest. She tears the downy hairs off with her mandibles then tucks them under her belly in a ball for transporting back to the nest. 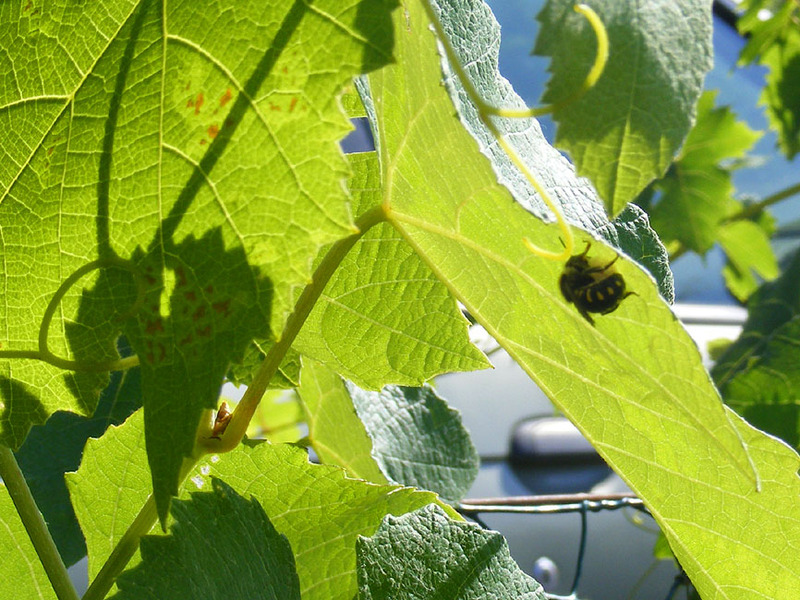 She's obviously been working on this grape vine for several days. You can see where the leaf has had time to go brown in the spots she has taken fuzz from before. Here's a view of the underside, showing the patches of missing fuzz. It's so quiet I can hear a Red Squirrel rasping open a hazelnut shell too. Some days it is quite petulant about my arrival, rushing about in the lower branches, stamping its feet, flicking its tail and chirring at me to go away. away so it can get back to helping itself to our hazelnuts. The last time I talked about out second bathroom, I was working - very slowly - alone, building the new floor. 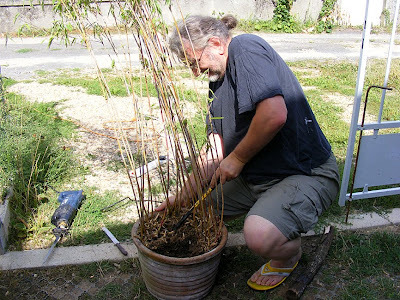 Stéphane has now returned from his holiday, so work has recommenced and is being done a lot faster. First thing that needed doing was finishing the frame and putting down the new floor surface. 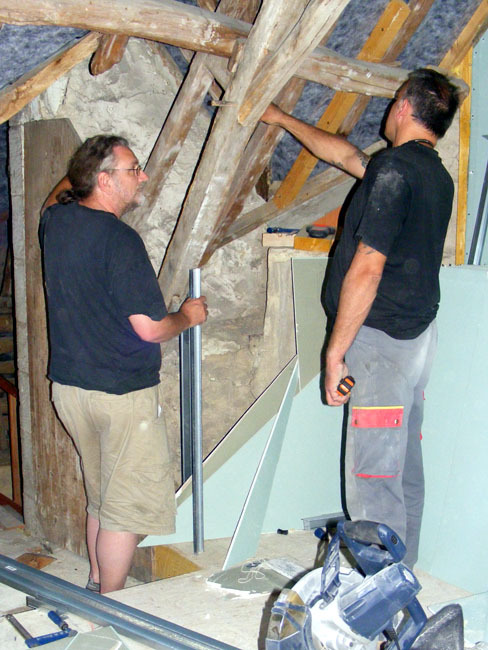 This was achieved quite quickly, which meant we could get on with building the frame for the insulation of the walls and ceiling. Our plan has been to dry line the walls and ceiling, putting 100mm of glass wool behind the walls, and 200mm of glass wool behind the ceiling, with the final effect looking something like this) in cutaway). It wasn't until the framing for the walls had commenced that I started having doubts about our plans: the new ceiling would leave the St. Andrew's cross visible, but there was a load of very interesting, quite historic, and (quite frankly) lovely carpentry that was going to be hidden. The woodwork in the ceiling. This was feeling increasingly wrong, so on Tuesday evening we told Stéphane that there was a change of plan, and that the ceiling line would now be like this. Our change of plan was met with a certain amount of resignation dressed as stoicism, but the change was early enough that nothing we had done needed to be undone. 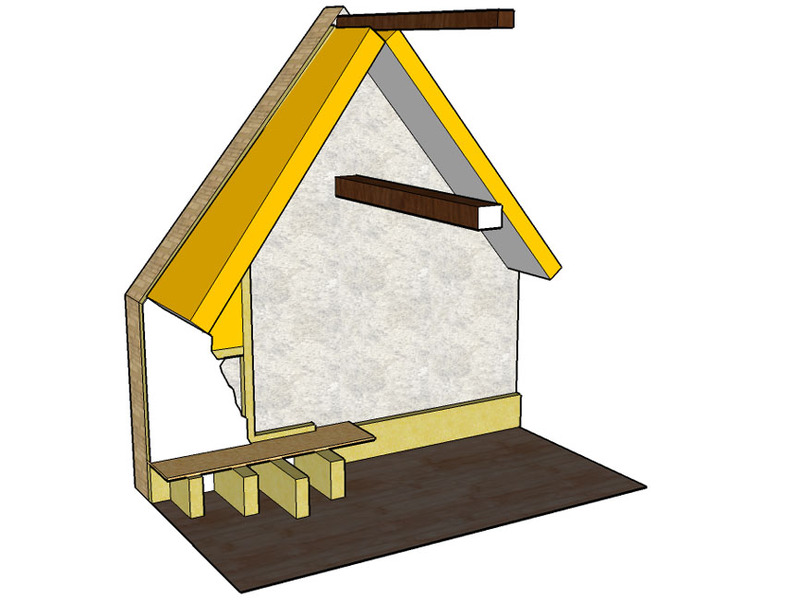 It will make cutting the plasterboard a lot less complicated as we no longer have to cut odd shapes to accomodate posts and angle posts. We realise that having all that exposed woodwork will mean dust, but it will be worth it. 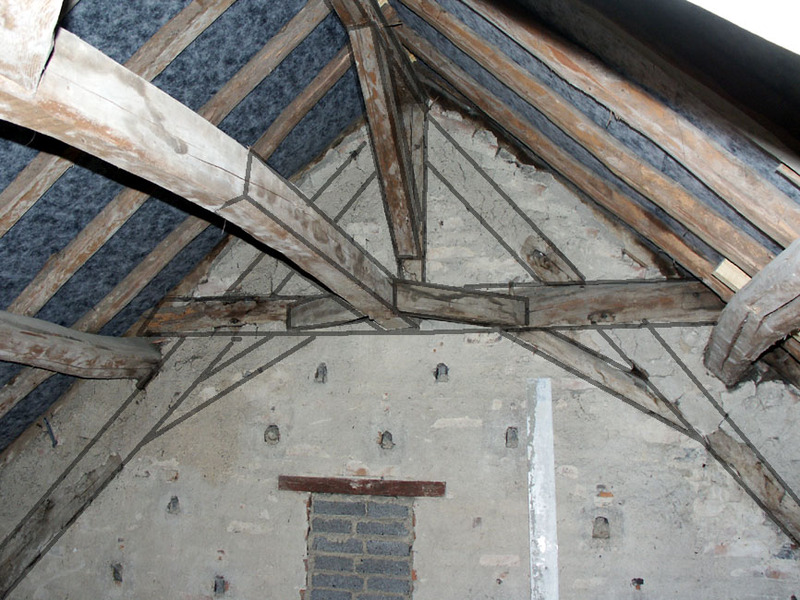 Not everyone has the opportunity to live with 16th century woodwork, so we feel really pleased to have made a decision that values the work of an unknown artisan all those years ago. 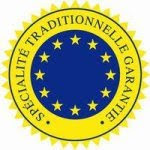 There are six official food quality labels falling under the auspices of the Institut national des appellations d'origine (INAO), as well as a number of other logos and medals administered by private organisations. 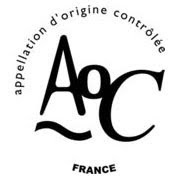 AOC - The Appellation d'origine controllée, is a French label (pictured below) created in 1905, guaranteeing a strong and direct link between the product, its methods of production and its geographic origin (i.e. the idea of terroir). Product quality and production methods and conditions are strictly controlled and monitored. Products must meet certain quality criteria (especially with regard to taste) and each product has it's own particular specifications. Examples of products which can have AOC labelling - numerous raw milk cheeses; Roscoff onions; Bresse chickens; many wines. AOP -The Appellation d'origine protegée is a European label (pictured below), created in 1992. The guarantees are the same as for AOC and to obtain an AOP a French product must already hold an AOC. Examples of products which can have AOP labelling - dried Lapland reindeer meat; Bronte green pistachios. IGP -The Indication géographique protégée is a European label (pictured below) created in 1994. Producers form collectives and decide on the geographic boundaries for their product, which must be typical for the region and which they believe derives something special from its geographic location (i.e. the idea of terroir again). Product traceability is clear and validated. Production methods are not dictated, but in practice are generally traditional and with low chemical inputs. Examples of products which can have IGP labelling - Corsican clementines; Parmesan cheese; Agen prunes. STG - The spécialité traditionnelle garantie is a European label (pictured below) created in 1992. It recognises main ingredients or methods of production (i.e. traditional recipes), but is not concerned with geographic origin (i.e. it is possible to make the product anywhere in the EU, so long as the method of production is traditional). The products with this label must have existed in the marketplace for at least one generation and must showcase a specific foodstuff. Examples of products which can have STG labelling - Belgian beers; mozzarella cheese; Serrano ham; rope grown mussels; Neapolitan pizza. 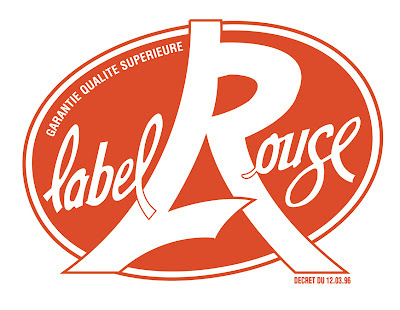 Label Rouge - This French label (pictured below) was created in 1960 and mainly applies to meats, poultry, cured and preserved foods, fruits and dairy products. The production methods, taste and overall quality of products are evaluated regularly. 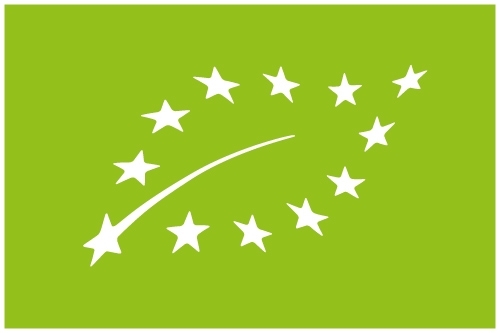 Most consumers believe produce with this certification is a guarantee of a high quality foodstuff, produced by best practice extensive farming methods. However, producers are not allowed to claim directly that their products are better than other traditional products. Each product is regulated by a separate set of strict criteria relating to the husbandry and production processes, but antibiotics and chemicals may be used. This label is open to all products, no matter what their geographic origin, including from outside the EU. AB - Agriculture biologique is French for 'organic farming'. The label was created in 1920 by a group of producers and others concerned about modern farming methods. It has been an officially recognised certification since 1981. The criteria has now been adopted Europe wide and a new logo (pictured below) was introduced in July 2010. The label's main concerns are the preservation of the environment, animal welfare and encouraging biodiversity. Producers in this category are particularly passionate and involved in all aspects of production. 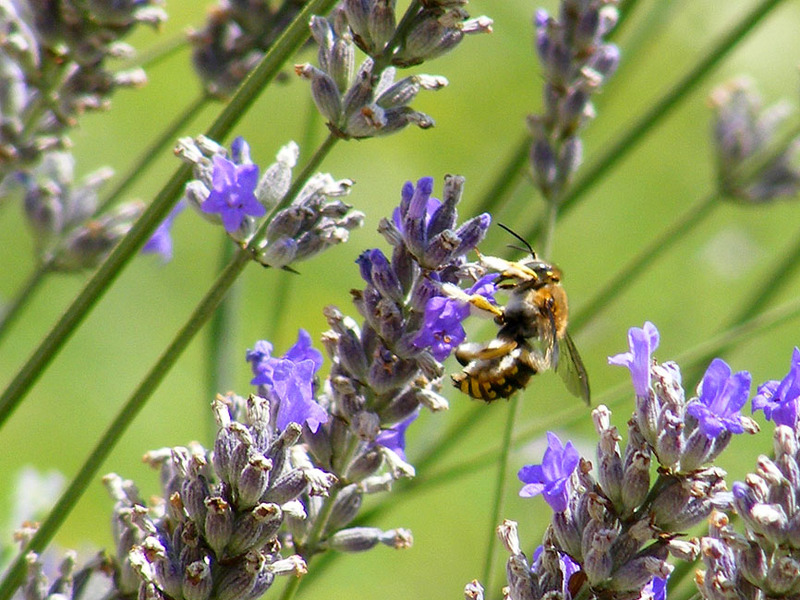 Consumers are guaranteed that these products are certified pesticide and GM free. Animals are treated with natural remedies (not antibiotics). The welfare of animals is paramount, so forcefeeding (le gavage) is forbidden, meaning that traditionally produced foie gras and magrets cannot be certified organic. Free access to open air pasture is obligatory. Only products comprising at least 95% organic ingredients have the right to certification. The result is an extremely high quality product (try French organic carrots or milk, for example), but the organic tomatoes available in the middle of winter, which have been transported from warmer climes, cost an absolute fortune and should be avoided. Produits de la ferme: this indicates that the product has been made on the farm, with one principal ingredient which is sourced directly from the farm. These products can be bought on the farm but there is no criteria with regard to quality. My experience is that these products are often extremely good value for money, being good quality and costing significantly less than in the shops. Produits de montagne: for foodstuffs other than wine, including herbs. The main ingredients and the processing must be located in the mountains. 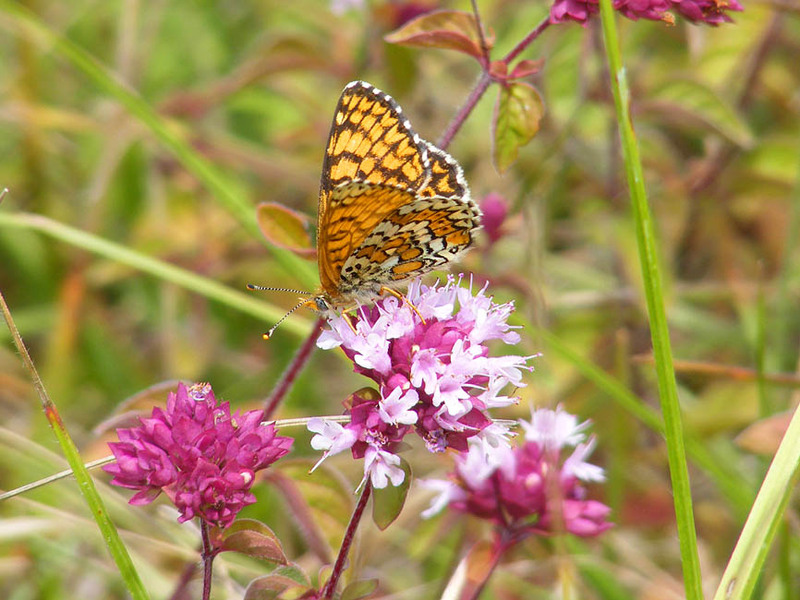 The good mountain pasture with herbs and wildflowers give a particular flavour to milk and cheeses, but there is no guarantee about use of chemicals or intensive husbandry. 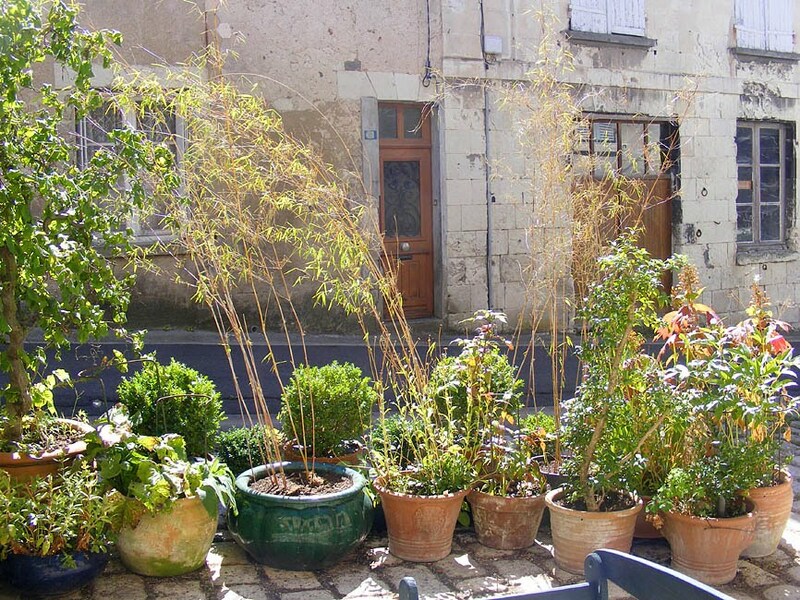 L'agriculture raisonnée: established in 2002, it aims to pre-empt tough regulations to protect the environment by encouraging farmers to plant hedges and green manures over winter. Less chemicals are used, but compared to AB certification, it is a much weaker label. Médaille du concours agricole: created in 1870, the agricultural show medals are administered by the Ministry of Agriculture and Fisheries. Around 17 000 products are tasted each year (wines, liqueurs, fruit juice, dairy products, oils, foies gras, honey, poultry, seafood and so on). One product in four receives a distinction and one in 12 a gold medal. 2400 judges taste and evaluate the products, but with 1416 gold medals issued, they are a bit devalued. These include the various Fairtrade marks, such as Artisans du Monde, Fairtrade (Max Havelaar) and Alter Eco. These are all administered by the Fairtrade Labelling Organisations. Nearly 1.5 million producers and disadvantaged workers benefit directly from Fairtrade schemes. Consumers have the satisfaction of becoming 'consumactivists', and it is a strong label, but for consumers based in France, not focused on local products. Produits de l'année - a marketing idea launched in 1987 to promote new products. They are nominated by consumers based on three criteria - attractiveness, innovation and usefulness. Last year 38 products received the label, including Kiri in a pot, compressed coffee, and ices in plastic pockets. Saveurs de l'année - created in 1996, a panel of 120 consumers judge products sent in by participating (fee paying) brands. About three quarters are given the right to use the logo for 14 months. This year 171 food products were put forward for the label. 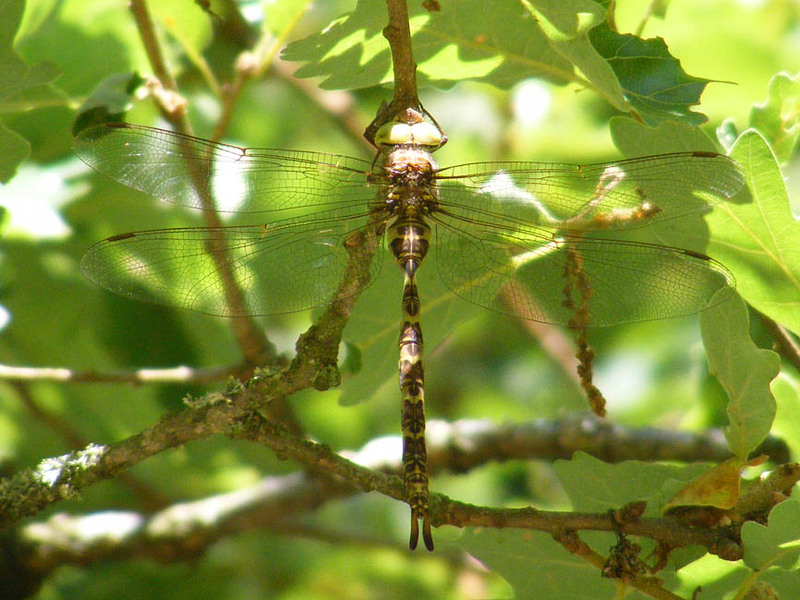 Not something you need fear, but one of the most enigmatic of our dragonfly species. August is peak flight time for the Western Spectre Boyeria irene (or l'Aeschne paisible, 'the peaceful hawker', in French). Unlike many dragonflies, which are brightly coloured, even twinkling metallic and iridescent, the Western Spectre wears full camouflage. 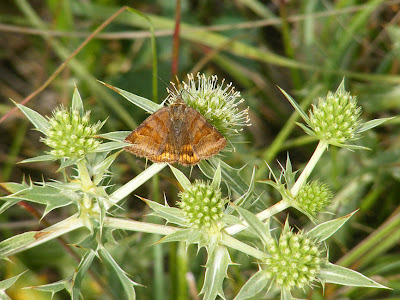 It is dull brown and greeny-gray and is one of those species moving northwards in response to changes in the climate. 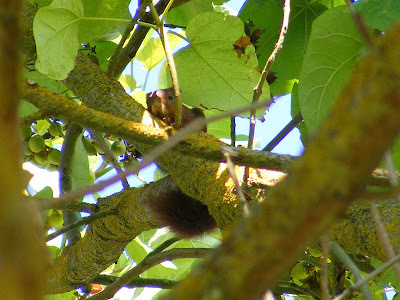 It is supposedly uncommon in the Touraine, although common in Berry and Poitou. I think it is likely that in the last few years, in its move north, the Touraine du Sud has been well and truly colonised by this cryptic species. Almost invisible, a female rests in an oak tree. 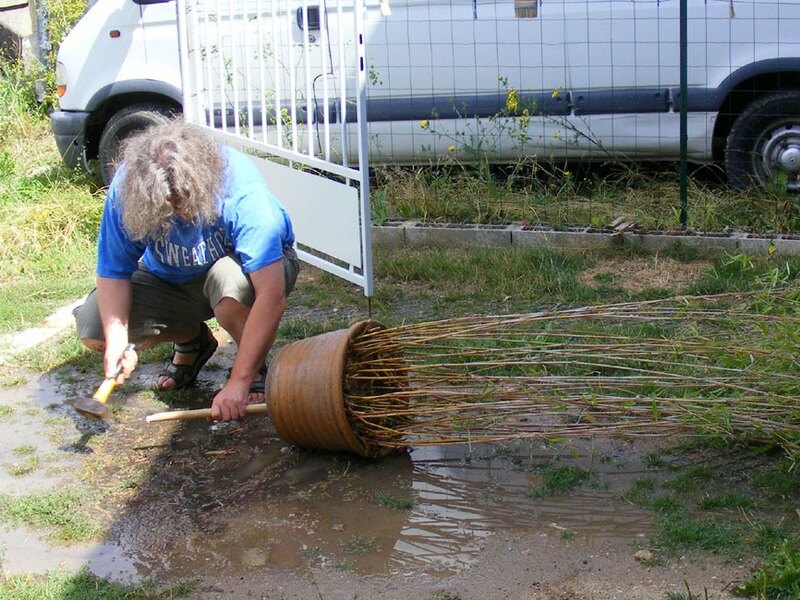 They like shaded flowing unpolluted water with wooded banks and a natural bed or well vegetated lake edges. I am told that if they are in danger they will feign death, but I've never seen them do this. They hunt mostly in the evening or early morning (although I have seen them hunting mid-afternoon a number of times), and will sometimes venture indoors in their quest for prey. My observation is that the females like to hunt under the eaves of buildings, and whiz around in rather a frenzy, so I am not surprised that they sometimes find themselves inside by accident. I've also seen them hunting around the edges of woodland clearings, a long way from any water. Males are more often seen patrolling a shady stretch of water, and can be distinguished from the females by their dark wing tips. They are not guarding a territory so much as on the look out females resting in some hideaway. 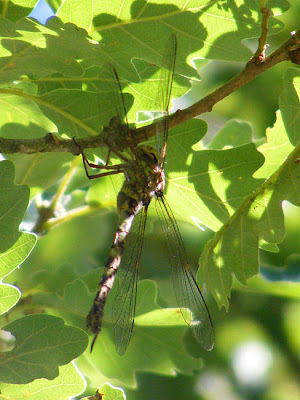 The Western Spectre is not threatened in France and its reputation for rarity is probably down to its very discreet habits, keeping to the shade and amongst the vegetation, making it difficult to spot even though it is a large dragonfly. It has, nonetheless, been listed as Vulnerable on the European Red List. I suspect that this may be in part because this is the one widespread species of Boyeria. The others are confined to islands and are critically endangered.